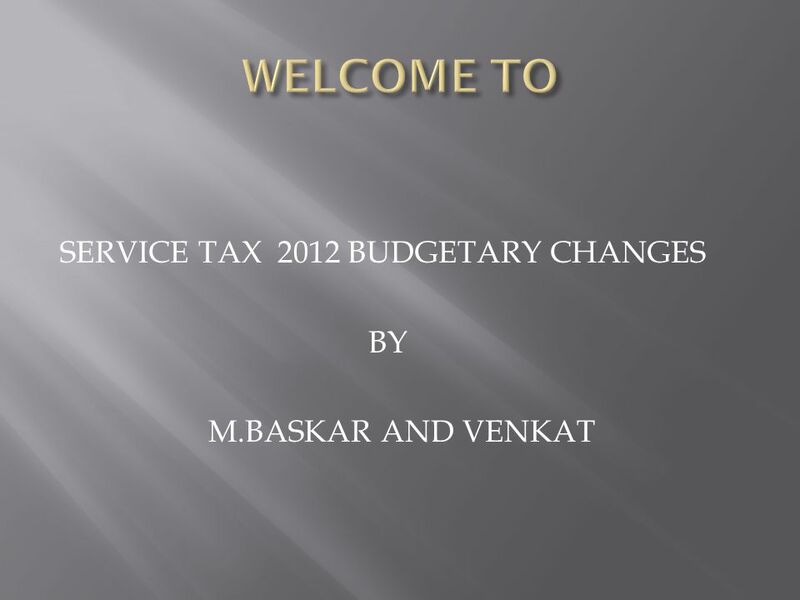 SERVICE TAX 2012 BUDGETARY CHANGES BY M.BASKAR AND VENKAT. 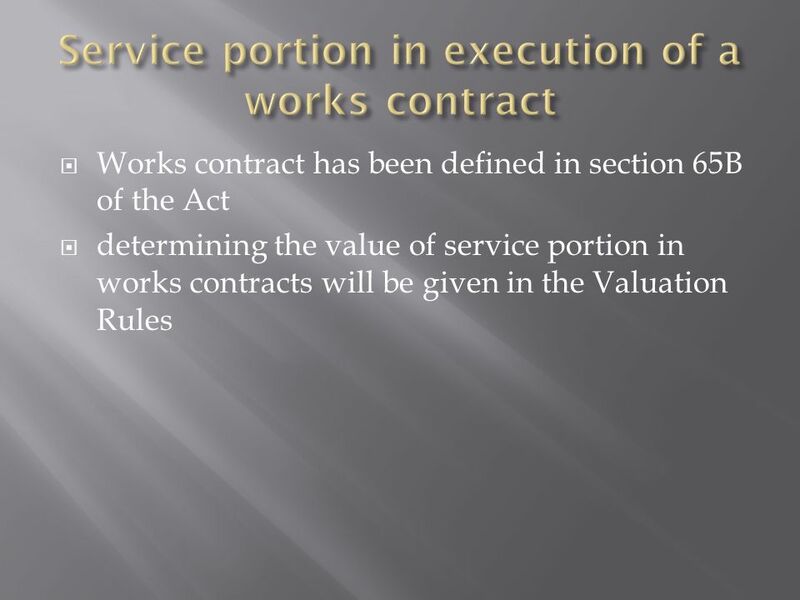 3 The rate of service tax is being restored to the statutory rate of 12% For works contracts from 4% to 4.8%. The rate for Cenvat reversal for exempt services has been revised likewise from 5% to 6% in Rule 6(3) of Cenvat Credit Rules (CCR), 2004. The dual tax structure for air transportation: partly specific, partly ad valorem - is being replaced with a uniform ad-valorem levy at standard rate with an abatement of 60% on all sectors and all classes. 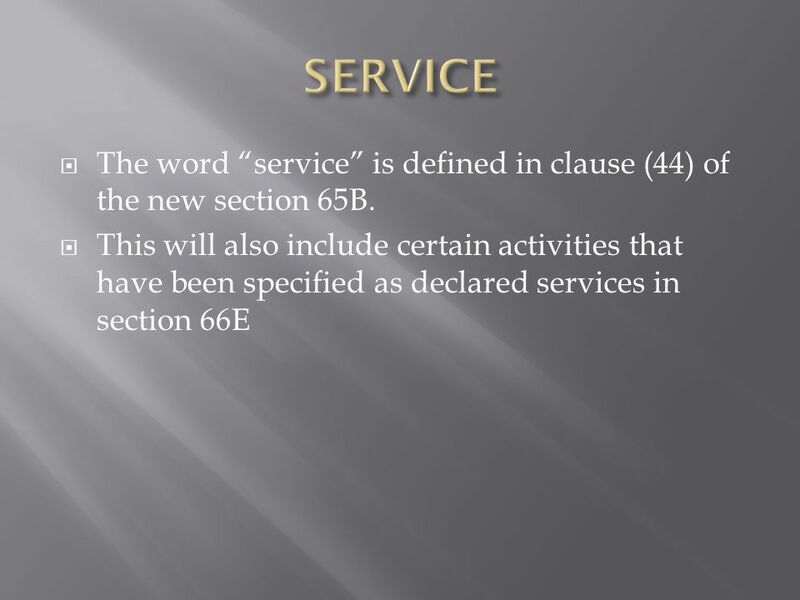 6 Service has been defined in clause (44) of the new section 65B and means any activity for consideration carried out by a person for another and includes a declared service. 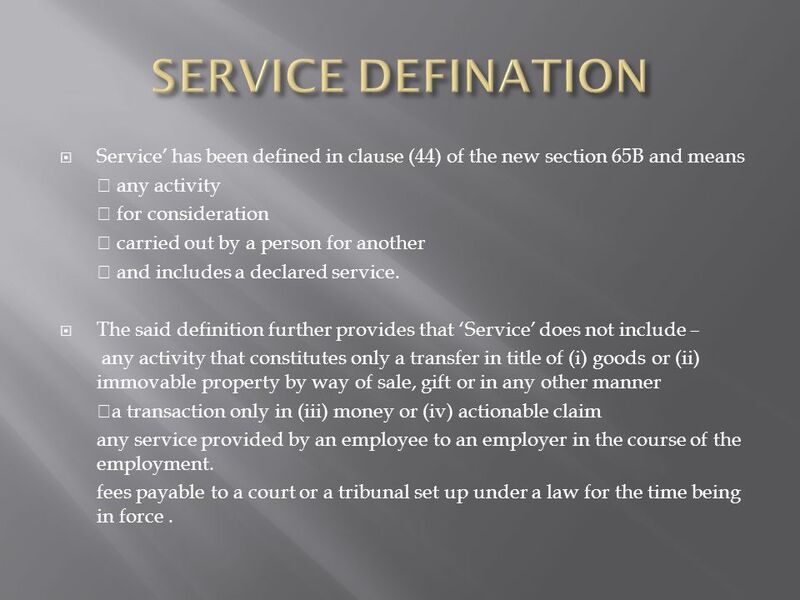 The said definition further provides that Service does not include – any activity that constitutes only a transfer in title of (i) goods or (ii) immovable property by way of sale, gift or in any other manner a transaction only in (iii) money or (iv) actionable claim any service provided by an employee to an employer in the course of the employment. fees payable to a court or a tribunal set up under a law for the time being in force. 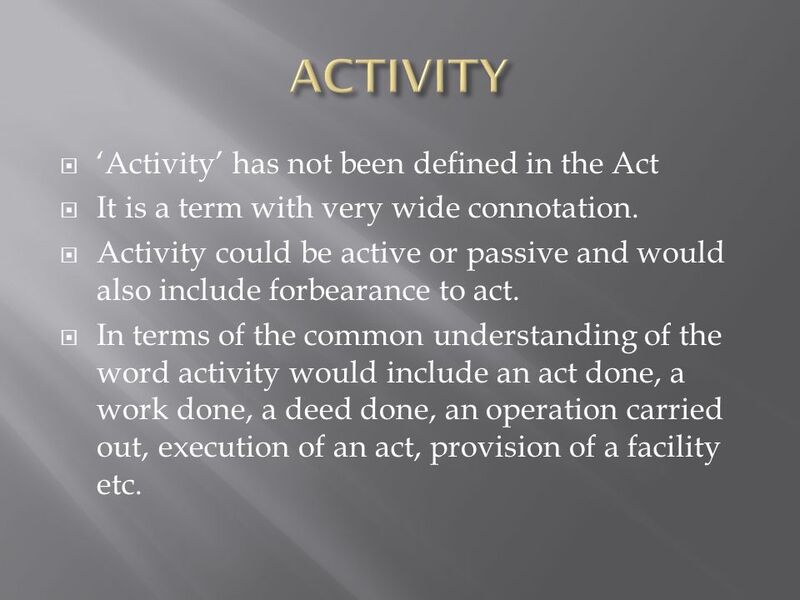 7 Activity has not been defined in the Act It is a term with very wide connotation. Activity could be active or passive and would also include forbearance to act. 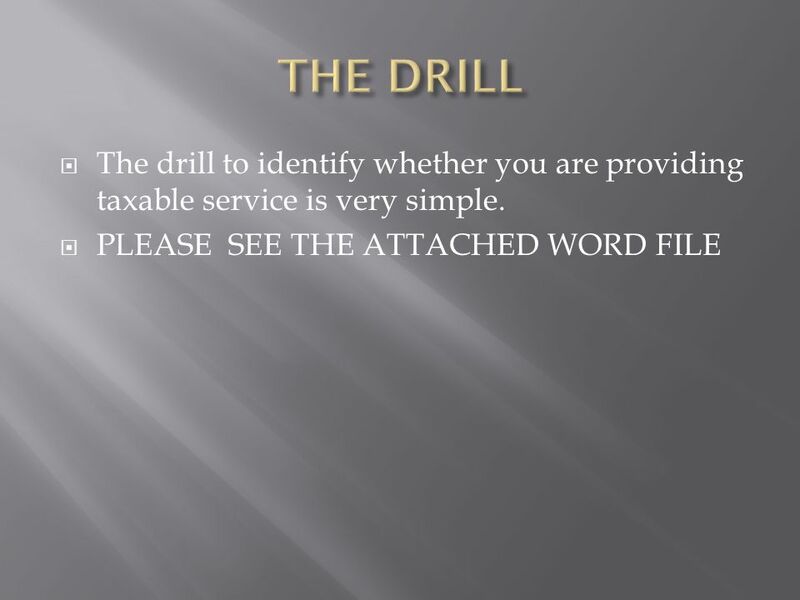 In terms of the common understanding of the word activity would include an act done, a work done, a deed done, an operation carried out, execution of an act, provision of a facility etc. 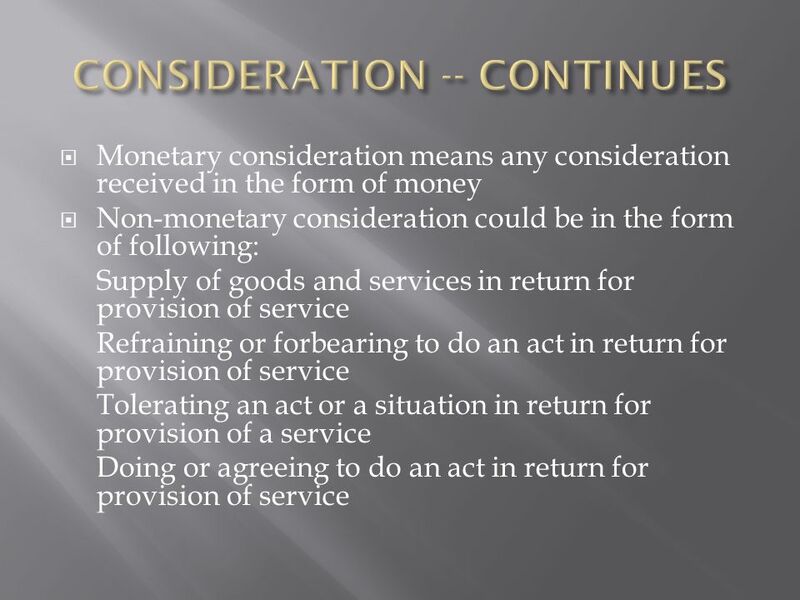 8 Consideration has not been defined in the Act. The definition of consideration as given in the Indian Contract Act, 1872 can safely be adopted to understand the concept of consideration. 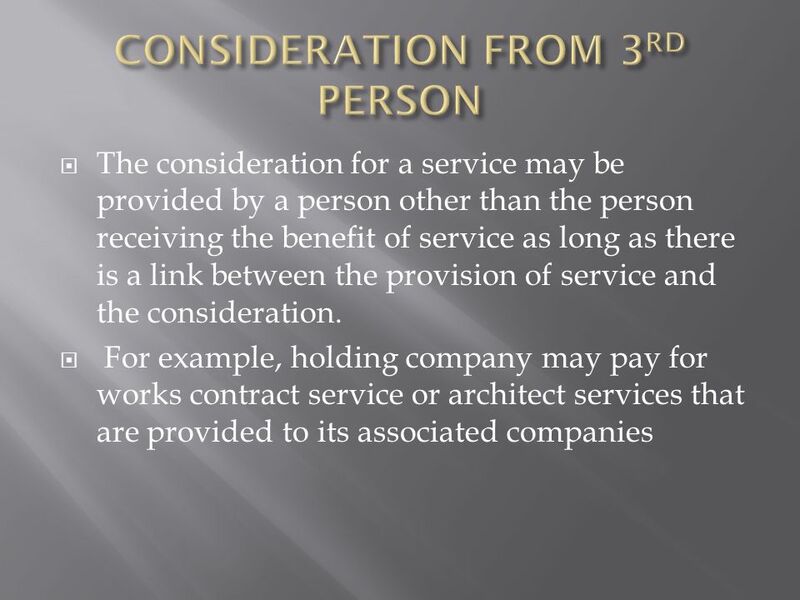 In simple term, consideration means everything received in return for a provision of service which includes monetary payment and any consideration of non- monetary nature as well as deferred consideration. 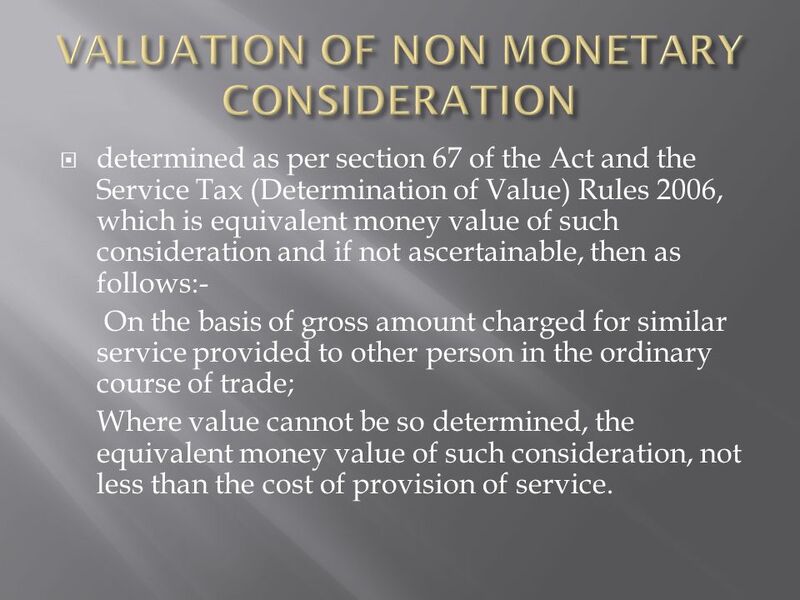 10 determined as per section 67 of the Act and the Service Tax (Determination of Value) Rules 2006, which is equivalent money value of such consideration and if not ascertainable, then as follows:- On the basis of gross amount charged for similar service provided to other person in the ordinary course of trade; Where value cannot be so determined, the equivalent money value of such consideration, not less than the cost of provision of service. 12 Person is not restricted to natural person. Person has been defined Section 65 B of the Act. 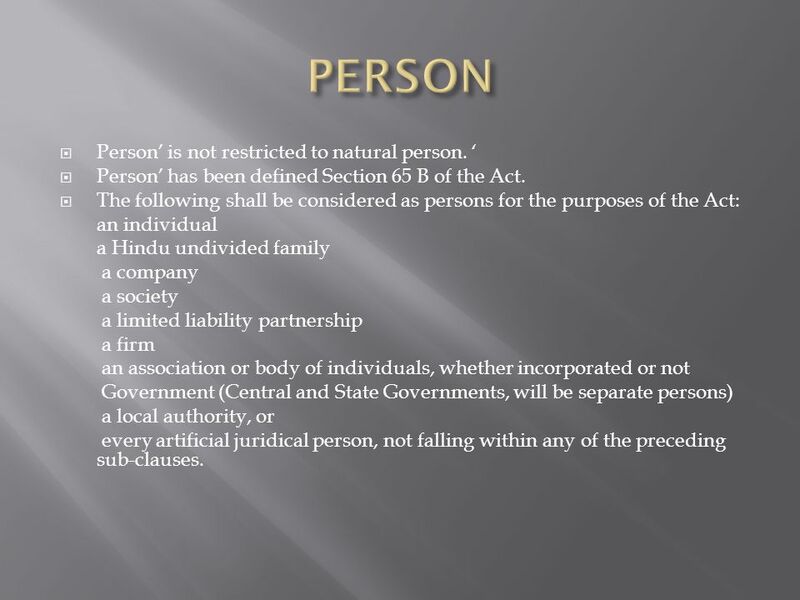 The following shall be considered as persons for the purposes of the Act: an individual a Hindu undivided family a company a society a limited liability partnership a firm an association or body of individuals, whether incorporated or not Government (Central and State Governments, will be separate persons) a local authority, or every artificial juridical person, not falling within any of the preceding sub-clauses. 14 4. development, design, programming, customization, adaptation, up gradation, enhancement, implementation of information technology software; 5. agreeing to the obligation to refrain from an act, or to tolerate an act or a situation, or to do an act; 6. transfer of goods by way of hiring, leasing, licensing or any such manner without transfer of right to use such goods; 7. activities in relation to delivery of goods on hire purchase or any system of payment by instalments ; 8. service portion in execution of a works contract; 9. service portion in an activity wherein goods, being food or any other article of human consumption or any drink (whether or not intoxicating) is supplied in any manner as part of the activity. 15 Intellectual property right has not been defined in the Act. 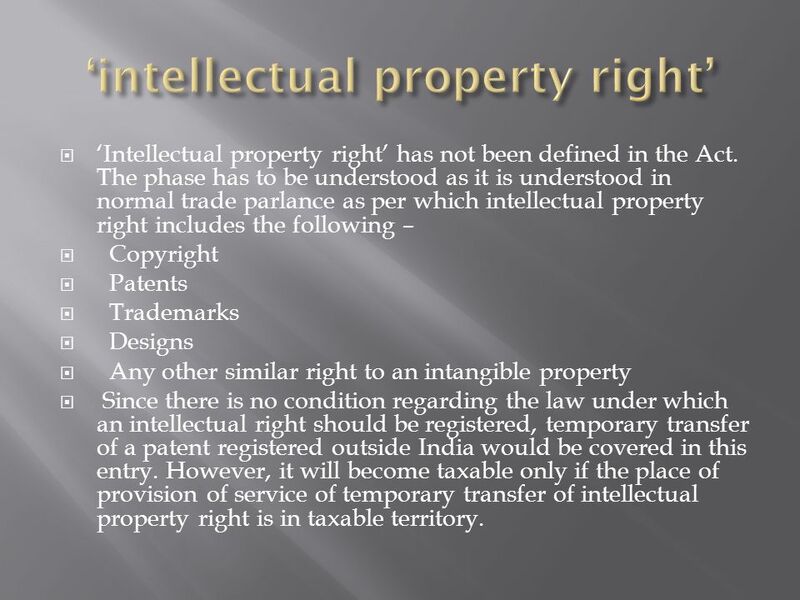 The phase has to be understood as it is understood in normal trade parlance as per which intellectual property right includes the following – Copyright Patents Trademarks Designs Any other similar right to an intangible property Since there is no condition regarding the law under which an intellectual right should be registered, temporary transfer of a patent registered outside India would be covered in this entry. However, it will become taxable only if the place of provision of service of temporary transfer of intellectual property right is in taxable territory. 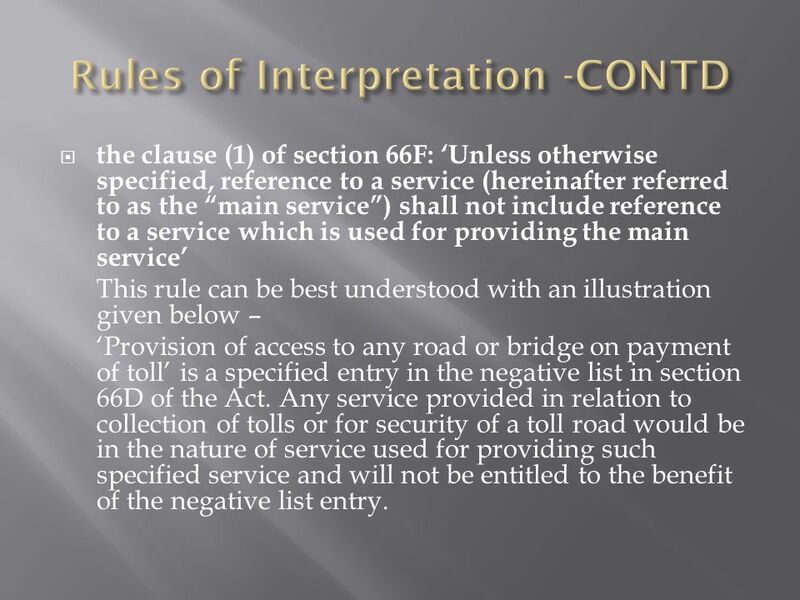 18 the clause (1) of section 66F: Unless otherwise specified, reference to a service (hereinafter referred to as the main service) shall not include reference to a service which is used for providing the main service This rule can be best understood with an illustration given below – Provision of access to any road or bridge on payment of toll is a specified entry in the negative list in section 66D of the Act. Any service provided in relation to collection of tolls or for security of a toll road would be in the nature of service used for providing such specified service and will not be entitled to the benefit of the negative list entry. 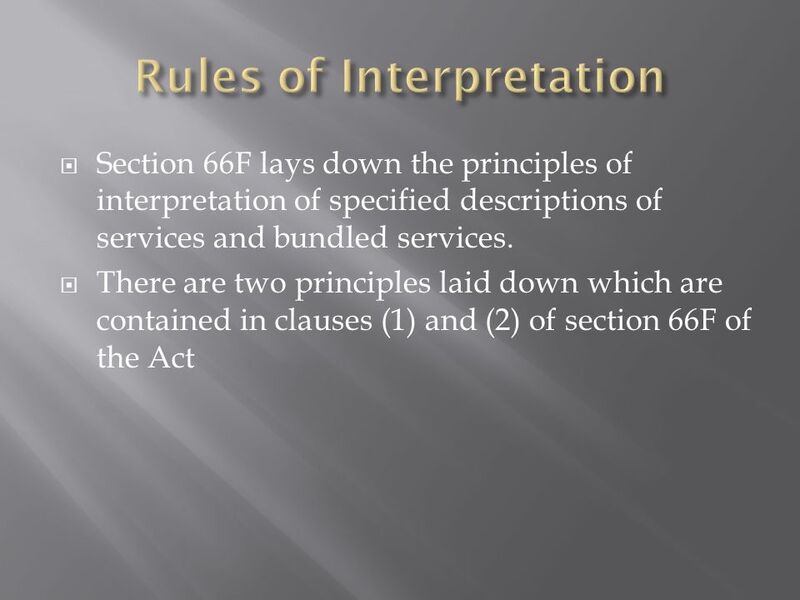 20 Sub-section (2) of section 66 F lays down : where a service is capable of differential treatment for any purpose based on its description, the most specific description shall be preferred over a more general description. 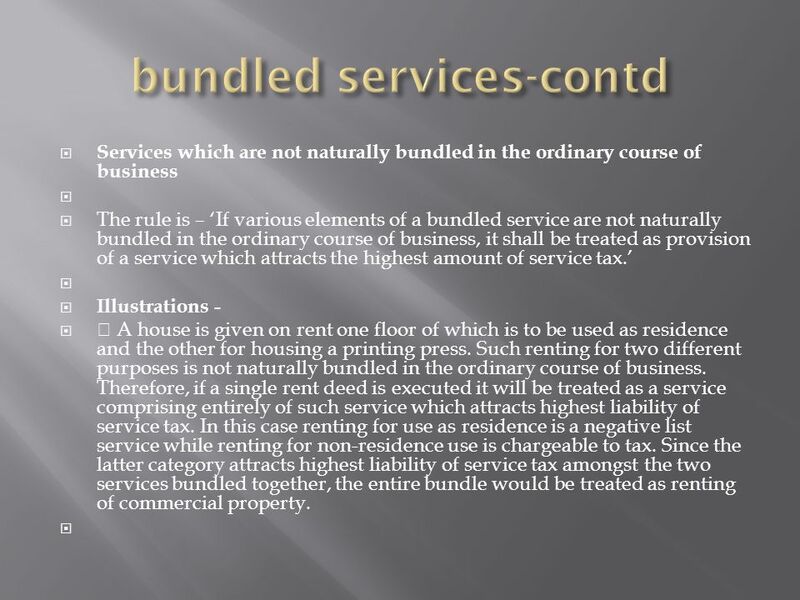 This rule predominates over the rule laid down in sub- section (3) relating to bundled services. 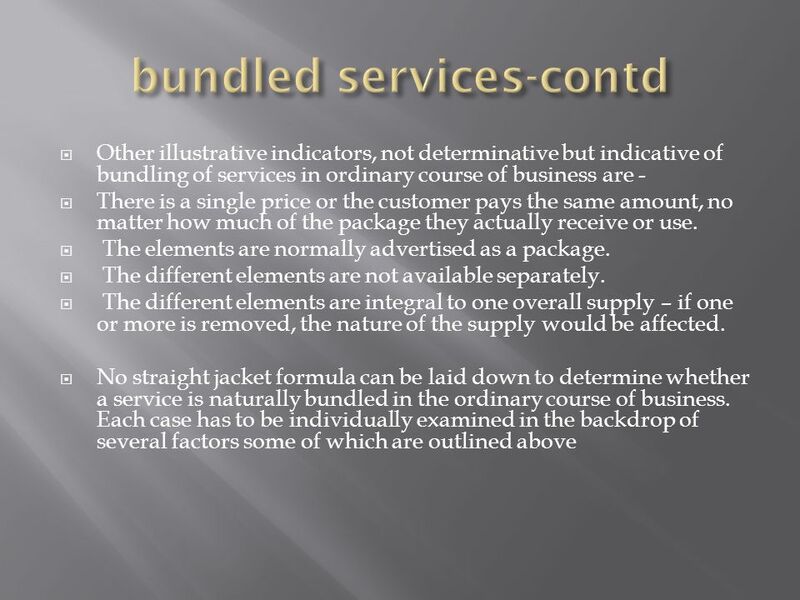 In other words, if a bundled service falls under a service specified by way of a description then such service would be covered by the description so specified. 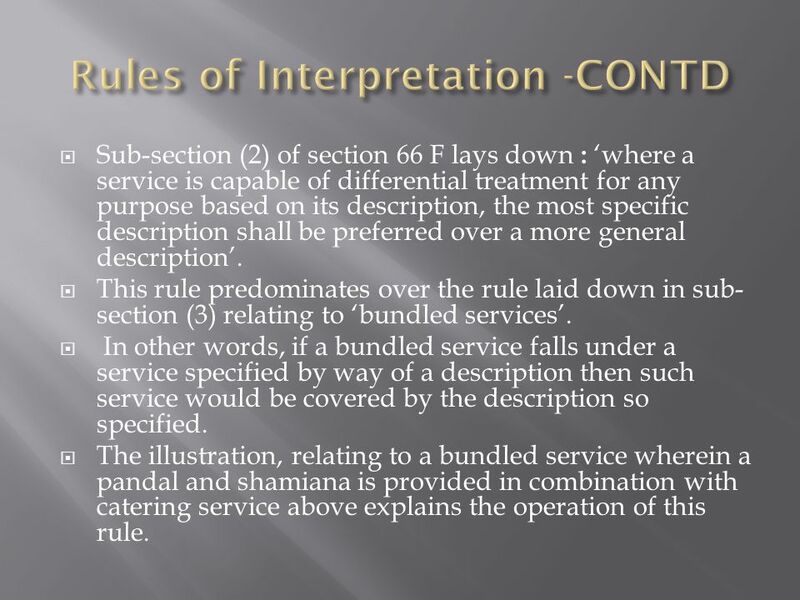 The illustration, relating to a bundled service wherein a pandal and shamiana is provided in combination with catering service above explains the operation of this rule. 21 Bundled service means a bundle of provision of various services wherein an element of provision of one service is combined with an element or elements of provision of any other service or services. 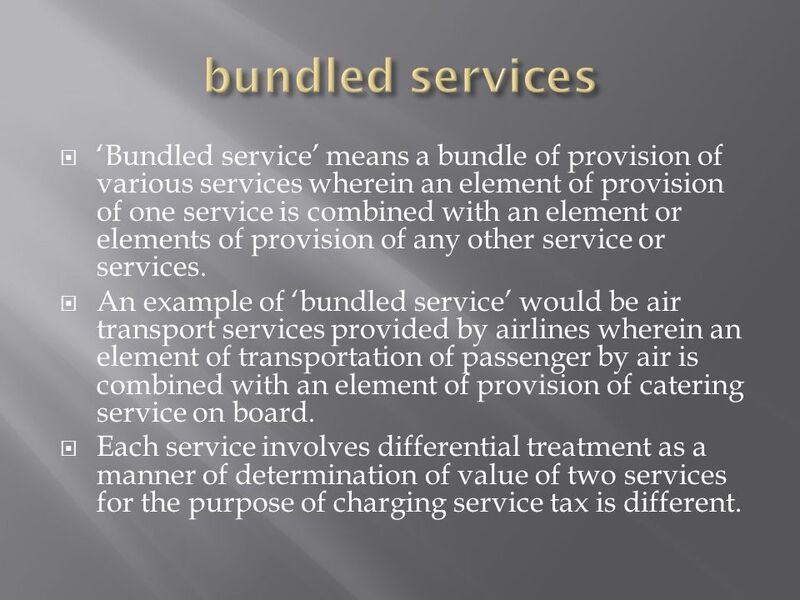 An example of bundled service would be air transport services provided by airlines wherein an element of transportation of passenger by air is combined with an element of provision of catering service on board. Each service involves differential treatment as a manner of determination of value of two services for the purpose of charging service tax is different. 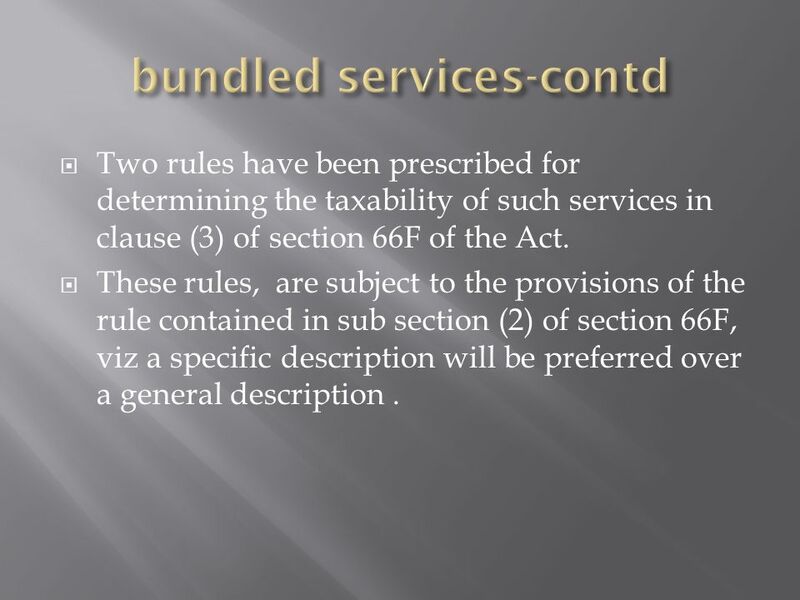 22 Two rules have been prescribed for determining the taxability of such services in clause (3) of section 66F of the Act. 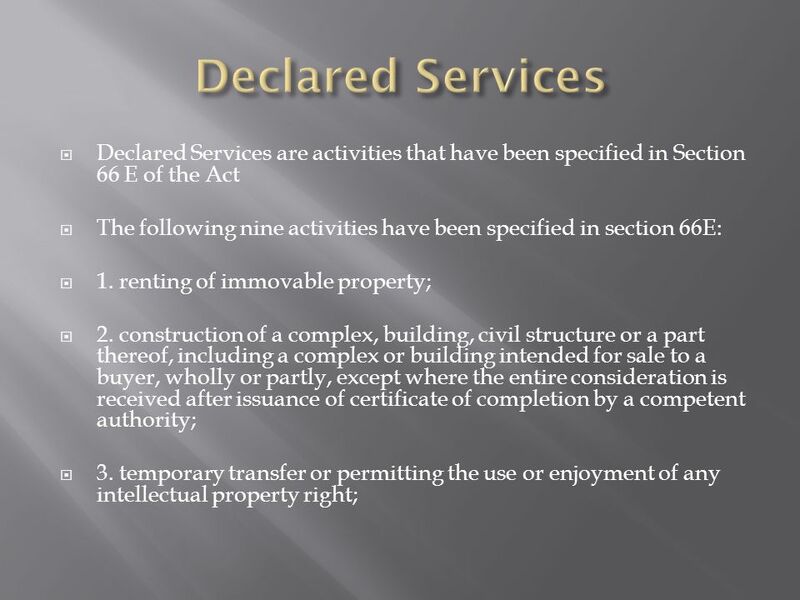 These rules, are subject to the provisions of the rule contained in sub section (2) of section 66F, viz a specific description will be preferred over a general description. 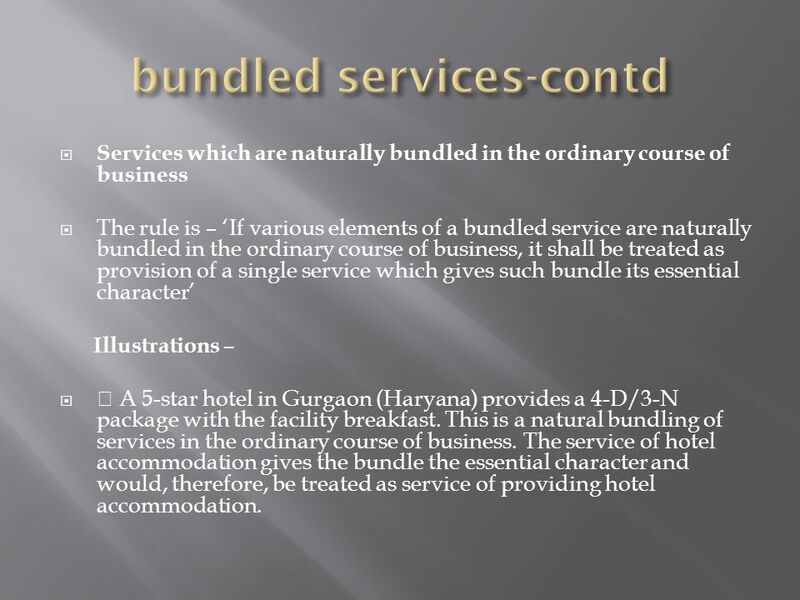 23 Services which are naturally bundled in the ordinary course of business The rule is – If various elements of a bundled service are naturally bundled in the ordinary course of business, it shall be treated as provision of a single service which gives such bundle its essential character Illustrations – A 5-star hotel in Gurgaon (Haryana) provides a 4-D/3-N package with the facility breakfast. This is a natural bundling of services in the ordinary course of business. The service of hotel accommodation gives the bundle the essential character and would, therefore, be treated as service of providing hotel accommodation. 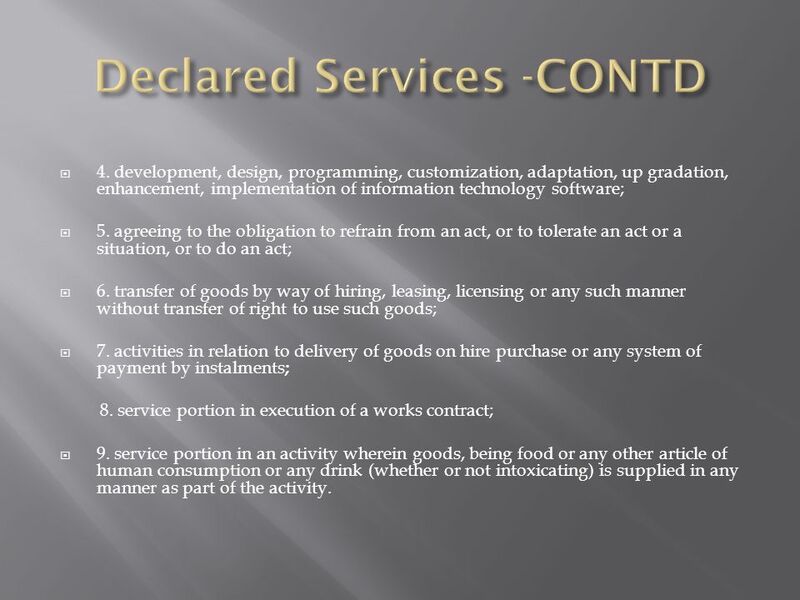 24 Services which are not naturally bundled in the ordinary course of business The rule is – If various elements of a bundled service are not naturally bundled in the ordinary course of business, it shall be treated as provision of a service which attracts the highest amount of service tax. Illustrations - A house is given on rent one floor of which is to be used as residence and the other for housing a printing press. Such renting for two different purposes is not naturally bundled in the ordinary course of business. Therefore, if a single rent deed is executed it will be treated as a service comprising entirely of such service which attracts highest liability of service tax. 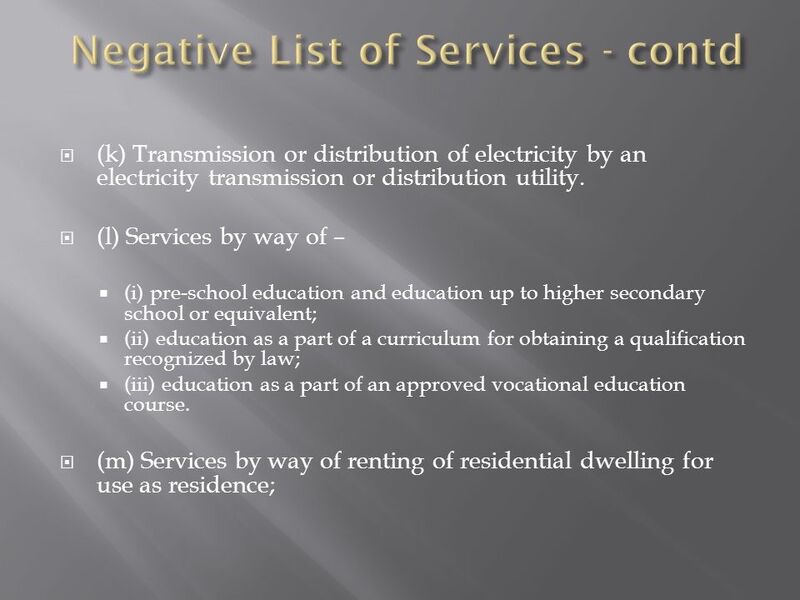 In this case renting for use as residence is a negative list service while renting for non-residence use is chargeable to tax. Since the latter category attracts highest liability of service tax amongst the two services bundled together, the entire bundle would be treated as renting of commercial property. 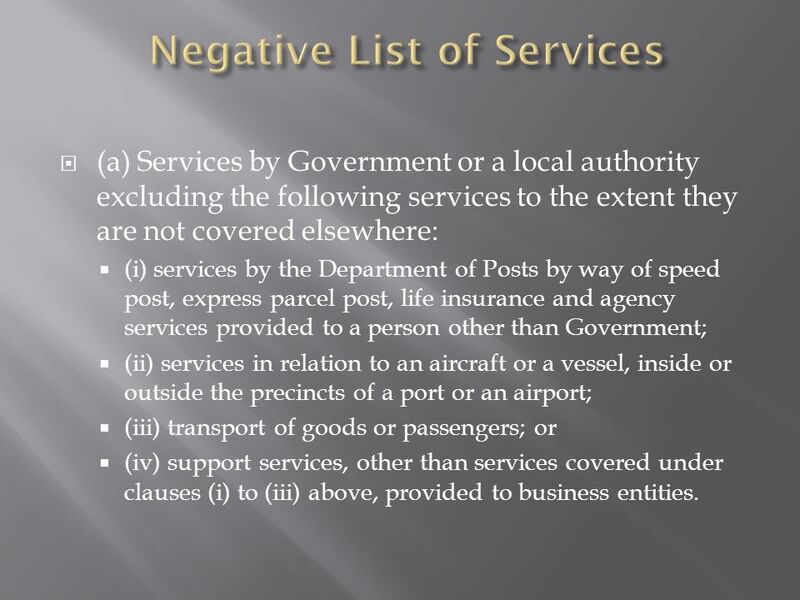 26 (a) Services by Government or a local authority excluding the following services to the extent they are not covered elsewhere: (i) services by the Department of Posts by way of speed post, express parcel post, life insurance and agency services provided to a person other than Government; (ii) services in relation to an aircraft or a vessel, inside or outside the precincts of a port or an airport; (iii) transport of goods or passengers; or (iv) support services, other than services covered under clauses (i) to (iii) above, provided to business entities. 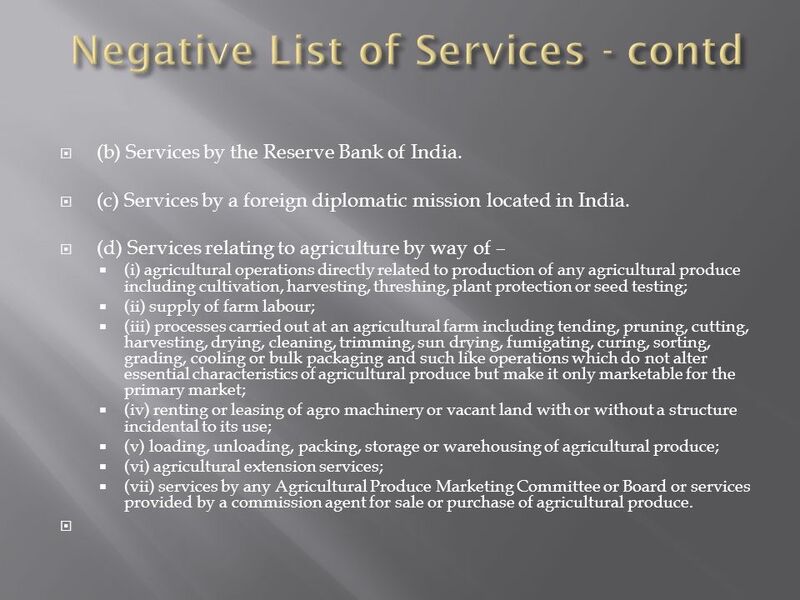 27 (b) Services by the Reserve Bank of India. (c) Services by a foreign diplomatic mission located in India. (d) Services relating to agriculture by way of – (i) agricultural operations directly related to production of any agricultural produce including cultivation, harvesting, threshing, plant protection or seed testing; (ii) supply of farm labour; (iii) processes carried out at an agricultural farm including tending, pruning, cutting, harvesting, drying, cleaning, trimming, sun drying, fumigating, curing, sorting, grading, cooling or bulk packaging and such like operations which do not alter essential characteristics of agricultural produce but make it only marketable for the primary market; (iv) renting or leasing of agro machinery or vacant land with or without a structure incidental to its use; (v) loading, unloading, packing, storage or warehousing of agricultural produce; (vi) agricultural extension services; (vii) services by any Agricultural Produce Marketing Committee or Board or services provided by a commission agent for sale or purchase of agricultural produce. 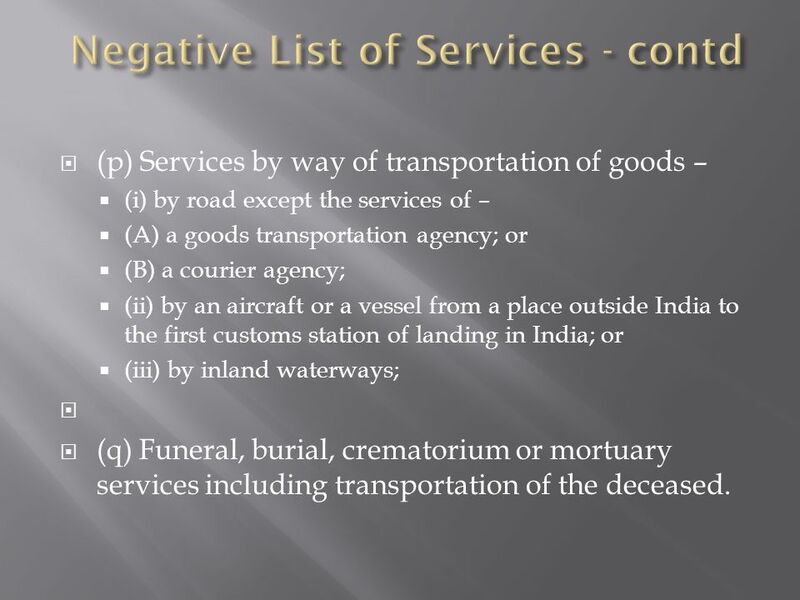 31 (p) Services by way of transportation of goods – (i) by road except the services of – (A) a goods transportation agency; or (B) a courier agency; (ii) by an aircraft or a vessel from a place outside India to the first customs station of landing in India; or (iii) by inland waterways; (q) Funeral, burial, crematorium or mortuary services including transportation of the deceased. 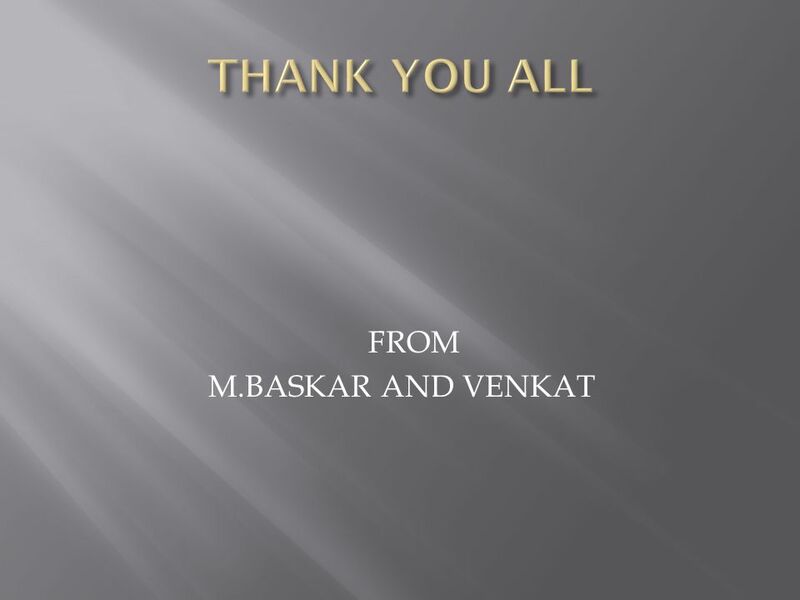 Download ppt "SERVICE TAX 2012 BUDGETARY CHANGES BY M.BASKAR AND VENKAT." Article 246 Subject-matter of laws made by Parliament and by the Legislatures of States (1) Notwithstanding anything in clauses (2) and (3), Parliament. All rights reserved All rights reserved | Preliminary & Tentative Point of Taxation Rules, 2011| 1 C h a l l e n g e U s.
Valuation under Service Tax Regulation Mrityunjay Acharjee. 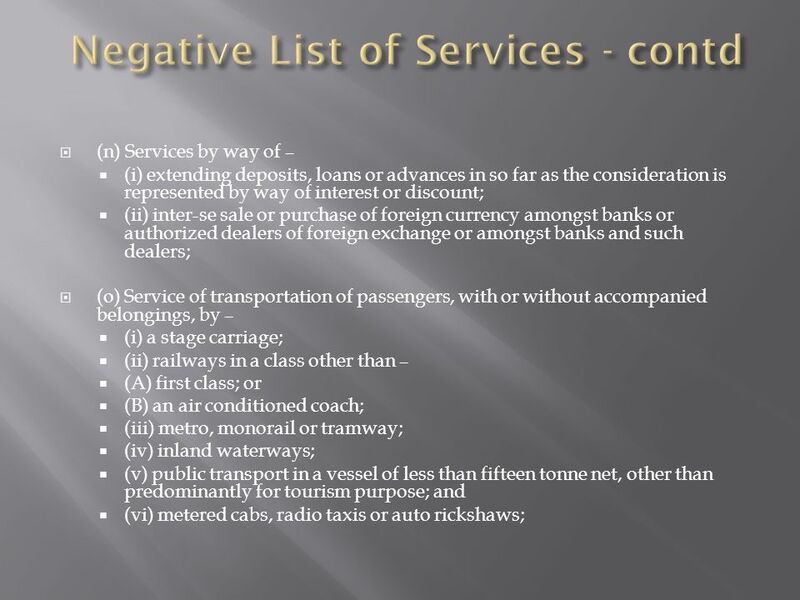 All the services specified in the Negative List shall remain outside the scope of service tax net. All other services, except those specifically exempted. Management of Business risks Paulius Čerka. How do you manage the risks of international business? Consider “ The management of international business. Dee Cee AssociatesDee Cee Associates Dee Cee AssociatesDee Cee Associates Budget 2014 – 15 Central Excise & Service Tax Highlights Dee Cee AssociatesDee. SERVICE TAX 1. As per Explanation to Section 65 (105) (zzzza) of the Finance Act, 1994, the term works contract” means a contract wherein,— (i) transfer. 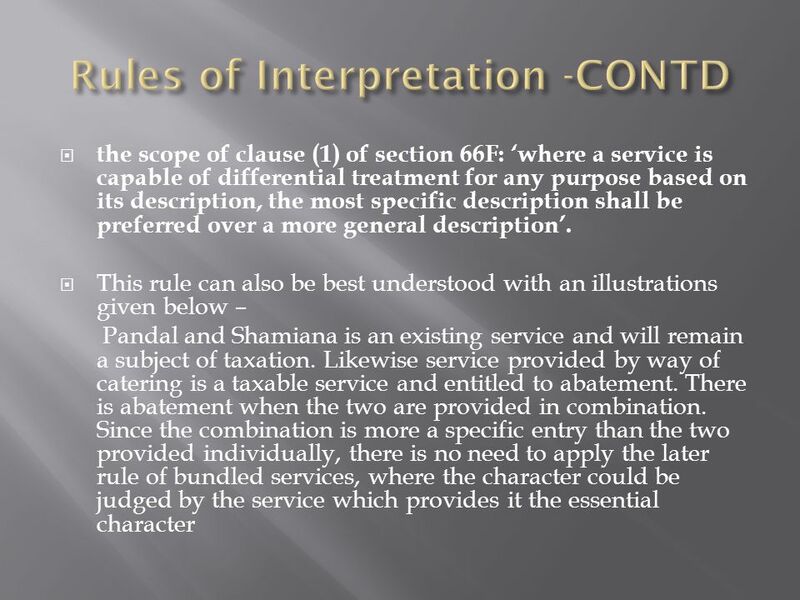 The definition of Service in Service tax - Issues & Perspectives A presentation by RAVINDRAN PRANATHARTHY B.Sc, M.L, PGDM (Germany), Advocate – Indirect. Abdul Aziz Tayabani Advocate High Court Noorani & Company. 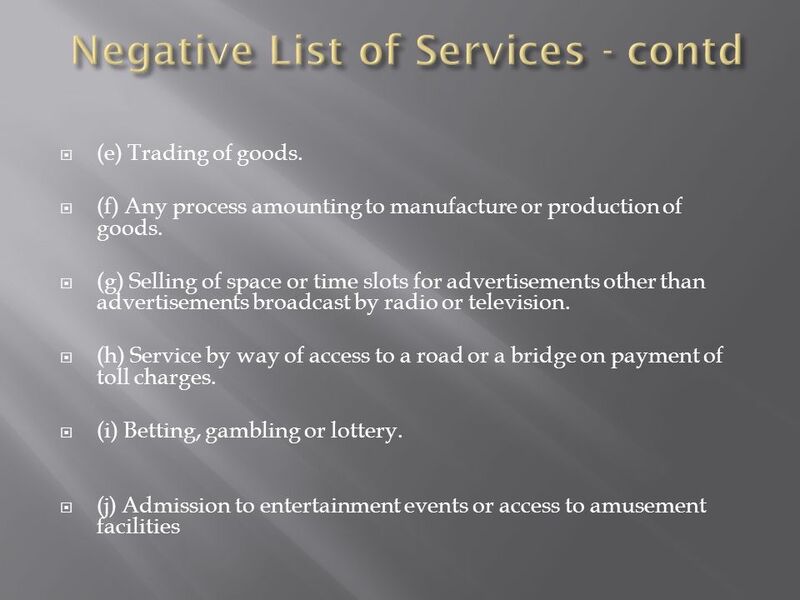 CA Lovekesh Sethi1 NEGITIVE LIST OF SERVICES Introduction Introduction Meaning and reasons for Negative list? Meaning and reasons for Negative list? New. 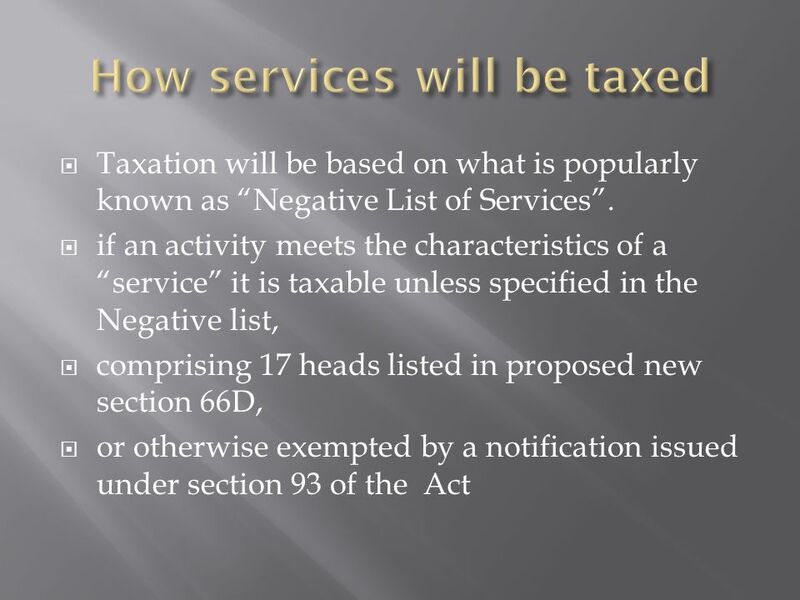 V S Datey Website – Background of service tax Till , service tax was based on positive list i.e. service listed are taxed. © COPYRIGHT 2012, INSTITUTE OF BUSINESS LAWS SERVICE TAX - VALUATION, ABATEMENT COMPOSITION SCHEME, TAXABLE TERROTORY, PLACE OF PROVSION OF SERVICE By. Page 1 Business income and associated enterprise Prashant Khatore. V S Datey Website – Reverse Charge in service tax. Reverse Charge Mechanism & Valuation Rules – J. B. Nagar CPE Study Circle CA Ashit Shah Shah & Savla Chartered Accountants 1. 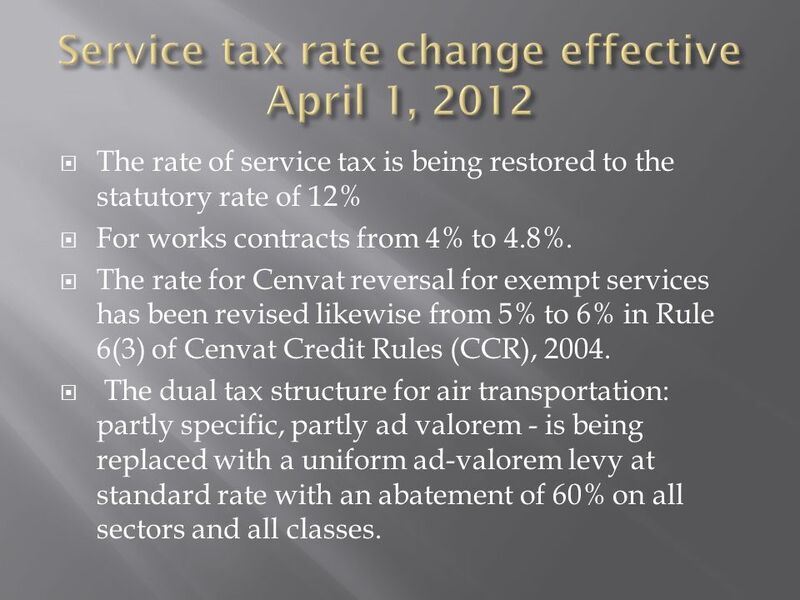 A - Rate of Service Tax: The Rate of Service tax increased from 10% to 12% effective from 01 st April 2012, this was by way of exemption notification.